As a Rhode Island product you have often been compared to Rocco Baldelli. Do you think that's an accurate comparision and why? I have heard many people compare me to Rocco, and I think you could say that is a fair statement. I believe we have similar tools, and ever since I started playing the outfield (about 2 years ago -- I was always a middle infielder. I switched to the outfield when college recruiters saw that my speed could be used better in the outfield), I've always strived to be like Rocco, so its very rewarding to know people make that comparison (Fire Brand). I'm sure Westmoreland gets a lot of comparisons to Rocco Baldelli because they are both speedy OF's from Rhode Island, but supposedly Westmoreland has very good patience at the plate, which is something Baldelli has always lacked. Rocco is pretty much a hacker up there and has never walked more than 30 times in a season. So patience at the plate might be something that Westmoreland has that can separate him from Baldelli. Local product was one of the top New England high school players in 2008. Slim, athletic build with the ability to add strength. Strong arm with nice outfield range. At the plate, "Westy" has above average power potential with outstanding plate discipline. Elite speed on the basepaths. Very intelligent, has a full ride to Vanderbilt. Also a great pitcher, he pitched a perfect game in April 2008, striking out 19 of 21 batters. Westmoreland had shoulder surgery in November 2008, and is expected to be out until June 2009 (Sox Prospects). Ryan Westmoreland never envisioned his professional baseball career would begin like this. • Contracted pink eye from a roommate. Ah, life as a minor-leaguer. And, spring training is still a few weeks away. 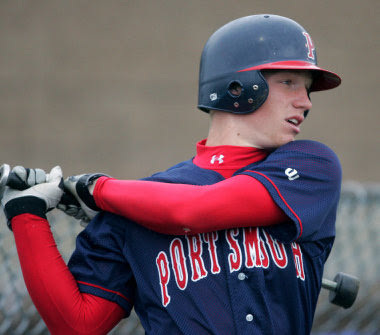 Westmoreland officially became a Red Sox prospect last August when he signed a five-year deal worth $2 million. The ink wasn’t even dry on the contract when the Sox shipped him to their rookie Gulf Coast League team in Fort Myers. It was then he was told there was a minor problem with his shoulder. Before he arrived in Florida last August, he hadn’t experienced any pain or discomfort in his shoulder. He was put through a battery of standard tests, and the results showed his shoulder was a little weak. Immediately the Red Sox development staff shut him down and put him on a rehab program. "Things progressed for the worst as the weeks and months went on," said Westmoreland. "Finally I found out I had to have surgery after I came back from the Dominican. It’s good that I got it done while I was young because I wouldn’t want to go into spring training feeling iffy about my shoulder and then something bad happens where I would miss an entire season." He hit extremely well during his stint in the Dominican Instructional League, going 10-for-15 with two triples, a double and a home run in four games. But he felt discomfort in his arm all the time. When he returned from the Dominican he met with Red Sox team physician Dr. Thomas Gill, and it was determined Westmoreland would have immediate surgery. The procedure went very well and Westmoreland arrived in Fort Myers a few days after Christmas to continue his rehab at the minor-league complex. From a shoulder standpoint, he’s been concentrating on his range-of-motion and stretching. He just began to work on strengthening his upper body, mainly his bicep and tricep, and he’s been doing a lot of leg work. "I feel good," he said. "It’s been a pretty hard and long road so far, but everything seems to be coming along very smoothly. Chip Simpson, who is the head physical therapist down here, is doing a really good job keeping everything on schedule. I’m just working as hard as I can to get ready to play again." Red Sox director of player development Mike Hazen keeps tabs on all the minor-leaguers in Florida by having daily communication with the staff. "He’s doing well and he’s getting back all of his range-of-motion at this point," said Hazen. "He's very much on target and we know he’s getting great care. Everything seems to be progressing very well." If things continue to progress, Westmoreland should be able to start swinging a bat in March and could begin to throw soon after. That means he could return to game action in late April or early May. At that point the development staff will determine whether Westmoreland will join a full- or short-season club. There’s a very good possibility he will play for the Lowell Spinners this summer. Rehab aside, Westmoreland can’t wait for spring training to arrive for a lot of different reasons. The fact that he’s playing for the same pro organization as his childhood baseball hero makes it even more special. Westmoreland first met fellow Rhode Islander Rocco Baldelli a few years ago when Westmoreland would hang around the Tampa Bay Rays because his uncle is the clubhouse manager at Tropicana Field, the home of the Rays. The two spoke a couple of weeks ago and Westmoreland also sent him a congratulatory text message when Baldelli signed with the Sox. "It’s great," Westmoreland said. "Never mind that there’s two Rhode Islanders playing in the Red Sox organization, he’s the guy I looked up to my whole life. He’s an outfielder from Rhode Island who made it. I started to be like him everyday since I was 13 because of where he’s from. I’ve always looked up to him. I can’t wait to see him." Westmoreland has already experienced some of the pros and cons of a minor-league player even before his first spring training. Red Sox players and staff will slowly begin to arrive in Fort Myers in the coming weeks, and Westmoreland will be one of them. "I’ve always wondered what actually went on during spring training," he said. "Now I get to see what spring training is like." I have visited this site.it give me information about work from home. i like to know more about this site. This site is very helpful for work from home.